This Fall semester I taught a class on the book of Hebrews, and we talked quite a bit about a literary device called a "chiasm." Especially in the prologue of Heb 1:1-4 and the beginning of the second major movement in 5:1-10, this textual feature is prominent. A chiasm is a parallel feature of a sentence or paragraph that has corresponding elements and highlights textual symmetry, but I like to call it a "there and back again" structure. Throughout the semester, this description led to a number of conversations about The Hobbit, the merits of the film adaptations, bits of Elvish lore, and whether The Desolation of Smaug would be epic, awesome, or exhilarating (the only obvious options of course). In the first review (95-96), Lewis notes the publisher's claim that The Hobbit represents "the work of a professor at play." Lewis counters that a "more important truth" is that the book belongs to "a very small class of books which have nothing in common save that each admits us to a world of its own—a world that seems to have been going on long before we stumbled into it but which, once found by the right reader, becomes indispensable to him." It is impossible to define the world of The Hobbit, Lewis insists, because it is new: "You cannot anticipate it before you go there, as you cannot forget it once you have gone." The dwarves you meet, for instance, are unique because "no common recipe for children's stories will give you creatures so rooted in their own soil and history as those of Professor Tolkien—who obviously knows much more about them than he needs for his tale." In Lewis' estimation, "Though all is marvelous, nothing is arbitrary: all the inhabitants of Wilderland seem to have the same unquestionable right to their existence as those of our own world, though the fortunate child who meets them will have no notion-and his unlearned elders not much more-of the deep sources in our blood and tradition from which they spring." For Lewis, the book can be considered a children's book "only in the sense that the first of many readings can be undertaken in the nursery." His conclusion: "Prediction is dangerous, but The Hobbit may well prove a classic." In the second review (97-98), Lewis remarks that "all who love that kind of children's book which can be read and re-read by adults should take note that a new star has appeared in this constellation." The enduring value of The Hobbit is its mixture of elements that are not often combined: "a fund of humour, an understanding of children, and a happy fusion of the scholar's with the poet's grasp of mythology." A knowledge of children's literature will ill-prepare us for "the curious shift from the matter-of-fact beginnings of his story ('hobbits are small people, smaller than dwarfs-and they have no beards-but very much larger than Lilliputians') to the saga-like tone of the later chapters ('It is in my mind to ask what share of their inheritance you would have paid to our kindred had you found the hoard unguarded and us slain')." "You must read for yourself," Lewis urges, "to find out how inevitable the change is and how it keeps pace with the hero's journey." 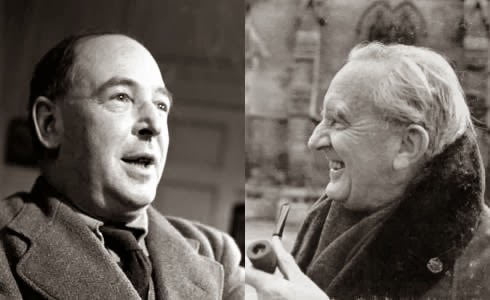 Though there are unexpected elements in this unexpected journey, Lewis notes that Tolkien "has the air of inventing nothing," as he has "studied trolls and dragons at first hand and describes them with that fidelity which is worth oceans of glib 'originality'." To paraphrase Lewis, though Tolkien seems to pull this world out of thin air, he pulls it off! One of my favorite parts of Lewis' reflective conclusion: "On the edge of a valley one of Professor Tolkien's characters can pause and say, 'It smells like elves.' It may be years before we produce another author with such a sharp nose for an elf." I, for one, am glad Professor Tolkien managed to pick up the scent.